Bucher reports that the Rockets front office “will examine all options” and that they were “devastated” when they heard the news today about Yao’s injury. You can bet they are working some long hours to figure out what they will do with Yao this season and beyond, and perhaps try to find some help at the center position. Here’s the video update from Bucher (excuse the commercial at the beginning). From what we gather and remember Yao saying over the summer, the most viable option at this early stage is that Yao would probably choose to have the fracture heal over time rather than have surgery again. Either way, I hope Yao and Hill have a chance to talk over the coming days and weeks so Yao may get some inspiration from Hill’s trials and tribulations in coming back from this type of ankle injury. But if Yao decides to retire, you can’t hold it against him. But I’m not mentally prepared for that, nor are alot of people who think Yao still has too much game left in him. Since we don’t have any details yet from Yao’s doctors, here’s the next best thing: an interview that Houston Sportsradio 610 had with orthopedic surgeon Dr. Kenneth First (not affiliated with Yao or the Rockets). It’s interesting that this injury is very similar to Grant Hill’s ankle injury from several years ago. Breaking news: Yao has a stress fracture in his left ankle. Out indefinitely. So sad, I can’t even put it into words. Here are more details as well as a short Rockets press release. Having gotten to know him over the years, I feel so bad for Yao. He doesn’t deserve this. His career may be over. Here’s part 2 of the video that FoxSports Houston produced that aired last month. Although it chronicles Yao’s recovery this past year from the foot surgery he had in 2009, I bet many of the same rehab techniques shown in this video are the same as what he is doing to recover from his bone bruise. Here’s part 1 of the video. At least we know that Yao won’t try to suit up like Tracy McGrady did last season when he was trying to force the Rockets to let him play when they said he wasn’t ready. Remember that? McGrady returns to the scene of his crimes tonight with the Pistons. It’s not known if Yao will be able to practice on Wednesday. I’m okay with that. Take it slow, big guy. 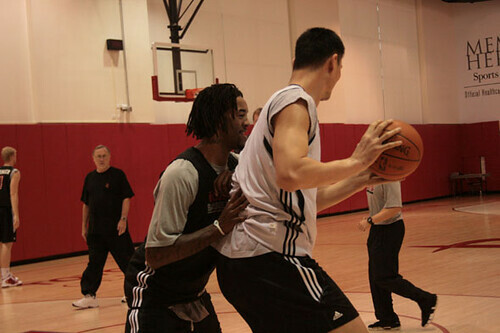 Raymond has posted some photos in the forum of a workout that Yao Ming had with Jordan Hill today at Toyota Center, the first time Yao has returned to the court for some real action since hurting his ankle last month. From reports of the workout, it sounds like Yao’s ankle is doing very well considering the intensity of the workout. Yao will stay in Houston while the Rockets are on their 2-game road trip, with Yao’s goal to get back on the court next Tuesday night at Toyota Center against Detroit. Yao works out against Jordan Thursday at Toyota Center as Rick Adelman and other Rockets’ conditioning staff look on. Click here for more photos from Yao’s workout. As you may have noticed, I’m not too enthused to blog about the Rockets’ loss to the Mavericks last night. Same story, different verse: the Mavericks went on a run the Rockets couldn’t stop, but unlike most other games, it was downhill from there, getting blown out to go 5-12 for the season. Ever since Yao suffered his undetermined injury last night in Washington, there were predictably a bunch of idiots today who filled the radio airwaves and posted comments on Web sites and blogs saying that, “Yao is done,” or “Yao’s a bust,” or “They should get rid of him,” etc. It amazes how many losers there are out there who just have to pop-off and spew sewage when they don’t know what the hell they are talking about. It was announced today that all Yao had was a sprained ankle, and he’ll only be out about a week. The sprain had nothing to do with his recent foot surgery. But you can bet these haters are now hoping Yao will get hurt again, and more seriously, so they can say, “You see, I told you so. Yao’s done.” Pathetic. All I have to say to these imbeciles is shut up and go hate on some other teams’ players rather than one of the hardest working, loyal Rockets you could ever hope for a team to have. LeBron is still a good target for you. You are currently browsing the archives for the Injury and rehab category.